The agency is helping Sun-Maid with its Grow Young campaign, targeting young audiences. KINGSBURG, CA: Millennials are said to have "killed" mayonnaise, beer, American cheese, and canned tuna, among other once-beloved items. Sun-Maid has hired Havas Formula to keep raisins off that list. Sun-Maid sent out an RFP for creative and media and brought on Havas Media in January. The same month, the company decided to hire Havas Formula as PR AOR. Quench has been Sun-Maid’s creative AOR since March 2018. Harry Overly, who joined Sun-Maid as president and CEO in November 2017, explained that the company is going through a "significant transformation" inside and out. 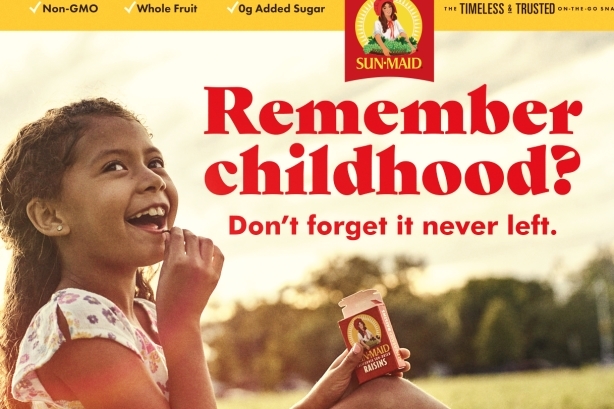 After a decade of relative quiet, he said Sun-Maid reignited its communications strategy in January with a national marketing campaign called Grow Young, aimed at millennials. The brand’s new TV spot shows parents celebrating the wonder of childhood all over again, this time alongside their own kids. Havas Formula’s Chicago team is managing the national and regional program, which includes media relations, thought leadership, traditional and social influencers, events and brand-building initiatives such as surveys. Havas Formula SVP Tara Reid is leading a team of five on the account. "We are reintroducing a brand that hasn’t had a lot of enthusiasm, excitement and innovation," said Havas Formula CEO Michael Olguin. The agency has secured press for Sun-Maid for the Grow Young campaign in outlets such as Fast Company, Business Insider and Cheddar. "We found that there is such an affinity for Sun-Maid being an amazing, iconic brand, we thought PR is going to be a critical element of our overall marketing plan," said Overly. "We are repositioning our targets. The biggest source of volume for raisins is still Baby Boomers, but spending power should be with millennial parents." Sun-Maid is considering influencer strategies focused on the brand’s emotional equity. Overly said he wants to get millennials down the dry fruits aisle, and one way the brand is doing that is through innovative products, such as sour raisins. "We also have to address other snacking occasions for parents and their children," Overly said. "Havas Formula is helping us figure out what that influencer network and experiential type of PR activity looks like to help us get this product out there." Overly was previously CEO of North America for olive-oil seller Deoleo, which is best known in the U.S. for Bertolli olive oil. While at the company, he worked with Havas Formula, which was Bertolli’s PR AOR. The olive-oil brand has since taken its marketing in-house, said Olgiun. Havas Formula also worked on Sun-Maid 10 years ago on a project basis, Olguin said. There was no incumbent on the account. Sun-Maid previously worked with PR agencies on a project basis. Overly said that when he joined Sun-Maid, no marketing team was in-place. The company has since brought on Alan Cheung as VP of marketing and Jackie Grazier as director of brand activation. Asked about the budget, Overly did not disclose specifics but said Sun-Maid has an eight-figure marketing budget. "That’s well over double what it was in previous run rates," Overly added. "It is a very heavy investment for the company."